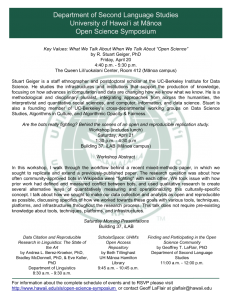 The Department Second Language Studies invites you to its Open Science Symposium on April 20-21, 2018. The event includes a keynote address and a workshop from R. Stuart Geiger from the Berkeley Institute for Data Science. The keynote and workshop are accompanied with presentations given by faculty in the Department of Linguistic, UH Mānoa Hamilton Library, and the Department of Second Language Studies. Please RSVP for this event (space is limited). 4:40 p.m. – 5:30 p.m. Openness in science is hard to disagree with as an abstract principle, but what exactly do we mean when we call for science to be made open — or more open than before? In this talk, I introduce and unpack the many different goals, strategies, products, values, and assumptions of the broad open science movement. It can be hard to make sense of all the different ways people are calling for science to be made more open: free-to-download publication PDFs, datasets re-usable by anyone, documented workflows or lab notebooks to support reproducibility, open source scientific software packages, publicly-funded computing infrastructure, public peer reviewing platforms, citizen science research projects, alternative metrics for publications and researchers, diversity and inclusion initiatives, and better public-facing science communication. Instead of pursuing openness simply for openness’ sake or focusing too closely on any single specific problem or solution, I call for scientists to think broadly about why openness is a value for science in society and who will benefit from making science more open in different ways. Are the bots really fighting? Behind the scenes of an open and reproducible replication study. In this workshop, I walk through the workflow behind a recent mixed-methods paper, in which we sought to replicate and extend a previously-published paper. The research question was about how often community-approved bots in Wikipedia were “fighting” with each other. We took issue with how prior work had defined and measured conflict between bots, and used qualitative research to create several alternative ways of quantitatively measuring and operationalizing this culturally-specific concept. I talk about how we sought to make our data collection and analysis as open and reproducible as possible, discussing specifics of how we worked towards these goals with various tools, techniques, platforms, and infrastructures throughout the research process. This talk does not require pre-existing knowledge about tools, techniques, platforms, and infrastructures. Abstract[/ezcol_1third_end] [ezcol_1third] In this talk we discuss the past and future of the practice of citing research data in linguistics publications, with the aim of encouraging more language scientists to conduct research that is as sound and reproducible as possible. We discuss several initiatives to change the atmosphere of the discipline to one that is more data-aware, including the Austin Principles of Data Citation in Linguistics, and current efforts by the Linguistic Society of America (and others) to develop ways to evaluate the “data work” that many linguists undertake in service of more traditional academic output like publications. We also present easy ways for participants to get involved in data citation efforts in the field. [/ezcol_1third] [ezcol_1third] This presentation will provide a general introduction to Open Access and discuss how institutional repositories support OA. It will introduce participants to the UHM Institutional Repository, ScholarSpace and provide information on how to start a collection in the UHM repository. [/ezcol_1third] [ezcol_1third_end] The term open science has different meanings to different people. Fecher and Friesike’s (2014) review of the open science literature identified five schools of thought related to open science and their central aims. These aims include making scientific knowledge available and accessible, creating open tools for researchers, developing alternative impact metrics and peer-review processes, and promoting/supporting collaborative research. In this talk, I discuss communities, tools, and other resources for finding and participating in the open science community. The goal of this discussion is to provide interested students and faculty with answers to questions about how they can be involved in open science.